The importance of the 3 Series to BMW is underlined by the number of variants in the range; saloon, estate-style Touring, the GT version and performance models too. A further addition to the range has arrived in the form of the xDrive models, bringing four-wheel drive to the UK for the first time. The 3 Series has always been a core car for BMW and remains one of the most desired models in its range. A combination of its smart looks, strong image and an involving driving experience has kept it at or near the top of the premium saloon segment for decades, and over the years the range has been broadened to increase its appeal still further. Conversely BMW's xDrive models have a much shorter history in the UK, beginning with the X5 in 1999, although the range has expanded through the X1, X3 and X6 models since then. However it is worth noting that four-wheel drive versions of the 3 Series have been sold in Europe for many years, with the cost of converting the system to four-wheel drive being seen as prohibitive. That has all changed with the latest generation 3 Series however, and although only available with one petrol engine initially the xDrive 3 Series will be available in several configurations of bodystyle and engine. The extra traction is seen as desirable especially in poor weather, and fits in with BMW's commitment to driving dynamics. Outwardly there are no distinguishing features on the xDrive compared to a standard 3 Series other than some subtle badges, which will suit many buyers. Rather than being a pseudo off-road 3 Series the xDrive is different only under the skin with all the benefit being felt by the driver. The reassurance of extra traction is welcome in the 3 Series, although in dry conditions there is no obvious benefit over the standard car. Indeed the extra weight of the four-wheel drive system blunts the performance and economy of the petrol engine – the 320i xDrive is unquestionably an excellent car but it is outshone by its two-wheel drive siblings. The remote locking function is a simple and discrete one, while the car's saloon body ensures that your valuables can be locked out of sight for added peace of mind. Like an increasing number of cars, this 3 Series has grown slightly over its predecessor. 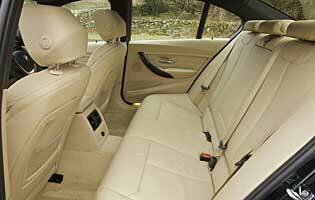 The result is a welcome improvement in rear legroom, and the car's boot is also a good size. In the cabin there's sufficient oddment storage space, and some of it is covered for added peace of mind. BMW's various instrument and displays have steadily evolved over the years, and this 3 Series presents occupants with a classy set of intuitive controls. The infamous -Drive controller remains for the heavily lifting, but like the rest of the car it's much improved. If selected, the widescreen sat-nav option does make life much easier for navigation duties. Along with a more premium-focused cabin comes improved refinement and comfort. That latter is thanks in part to a little more room for rear seat passengers. Supportive seats and minimal noise intrusion from the outside – tyres, wind – also helps. Like pretty much every car in this sector the 3 Series comes with a generous array of standard fit safety kit. The car's electronic stability and traction controls are unobtrusive but work well when required. And with enough airbags to fill the whole cabin, the level of occupant safety is reassuringly high. Over and above the the generous array of standard fit safety kit, the 320i xDrive is obviously aided still further by the extra traction of four-wheel drive. The car's electronic stability and traction controls are unobtrusive but work well when required and with enough airbags to fill the whole cabin, the level of occupant safety is reassuringly high. No 3 Series is worthy of the name if it doesn't offer an engaging driving experience, and the 320i xDrive certainly lives up to this reputation. The steering is sweet and accurate, with or without the optional Active Steering system, while the handling is neutral and adjustable. The four-wheel drive system does blunt the performance somewhat – if anything it feels too highly geared, but an increased engine choice later on will solve this. The traditional four-door saloon is not best placed to rival the more practical MPV class of cars. Isofix mounting points are present, but the modest rear door aperture can make life difficult. Boot space is also particularly rigid, and can't compete with, say, an X1 or X3. That said, for an undemanding mature family the five-seat arrangement does work. There are no pitfalls to catch out the novice driver with the 3 Series; it is sufficiently easy to drive, arguably more so in four-wheel drive guise. It is only the cost of purchase that will put it out of reach. BMW has worked hard on its image over the years, with the main focus on its cars' driving performance. This approach has softened of late as the firm seeks to broaden the appeal of its products. An increased focus on fuel economy and reduced emissions has earned it praise and helped boost sales at a time of rising car ownership costs. In four-door saloon form this 3 Series has grown slightly over its predecessor, with the most obvious improvement being easier access to the rear seats. Up front it's much the same as before, while the car's rear load lip is of a reasonable height not to hinder the loading and unloading of heavy or bulky items. Although the appearance of the audio system in the 3 Series has changed little, the systems have been gradually improved. The standard unit does a good job on all fronts – usability and sound quality. Move up to sat-nav and you can have a car with a wide screen display and a much improved i-Drive controller, and even Google connectivity. Bluetooth phone functions are straightforward, as is the ability to connect an Apple device. Subtle metallics are the order of the day with a 3 Series, although the freshness of the design means it looks good in white too. Taking a restrained approach with the cabin is also the best option, although there are more outrageous options to choose from. Being a saloon, it's always necessary to take care when reversing due to the added unseen length of the car's boot. Parking sensors, where fitted, will make life easier. Elsewhere, the car's steering delivers plenty of assistance at low speeds, while forward visibility is good. 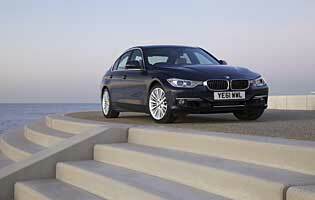 Petrol engine options – 320i (184bhp); 328i (245bhp); 335i (306bhp) petrol. 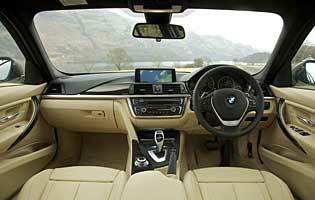 Diesel engine options – 316d (116bhp); 318d (143bhp); 320d Efficient Dynamics (163bhp); 320d (184bhp). Transmission options: six-speed manual transmission plus eight-speed auto transmission depending on engine choice. 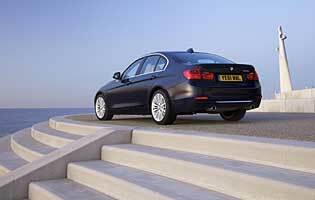 Trim levels: SE, Sport, Modern, Luxury, Efficient Dynamics (320d only).